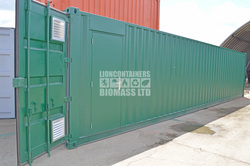 If you have a biomass housing conversion in mind, Lion Containers (Biomass) Ltd can help! Call us today to speak to a member of our friendly expert team. Wood drying reduces the moisture content of wood before it is used, and is used for woodworking and wood burning. When wood is burnt, it is usually best to dry it first, moisture affects the burning process with unburnt hydrocarbons going up the chimney. If a 50% wet log is burnt at hot temperatures with good heat extraction from the exhaust gas leading to 100 degrees Celsius exhaust temperature, about 5% of the energy of the log is wasted through evaporating and heating the water vapour. With condensers, the efficiency can be further increased but for the normal stove, the key to burning wet wood is to burn it very hot, perhaps starting fire with dry wood. Wood is air dried or kiln dried, usually the wood is sawed before drying but not always, as when the whole log is dried. Containerised wood kilns are the perfect solution to dry wood products using airflow, humidity control and moisture extradition when space is at a premium. Fans, temperature control and louvred vents are used as a system to dry wood in a speedy and energy efficient manner.